There are so many great restaurants in the greater Seattle, Washington area that it’s difficult to pick one to grace with your presence. Each neighborhood has it’s own secret or not so secret treasure. 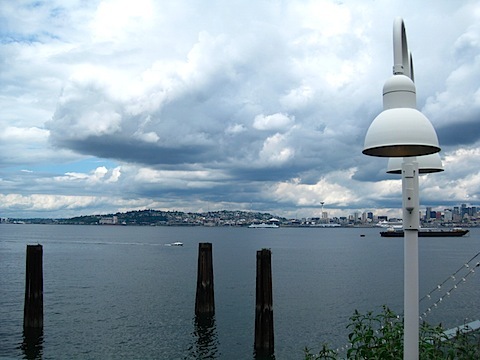 There is a little place in West Seattle that has fantastic food and spectacular views that can be enjoyed simultaneously. You may have heard of it, it’s called Salty’s and is located on Alki Beach. The dinner menu is all about the love of steak and seafood. The menu even goes so far to say that carnivores are welcome. It’s totally my kind of place. The Pepper Punch which is a 16-ounce T-Bone crusted with Madagascar peppercorns and topped with Rogue River Bleu Cheese. You can add a half-pound of king crab legs or snow crab legs if you like that kind of thing. Seafood Fritti Martini which includes fried salmon, halibut, scallops prawns and clam strips. The martini also comes with home made cocktail and tartar sauce. Seriously, my mouth is watering. There are also crab cakes, manilla clams and local oysters on the half shell available for your pleasure. Dinner at Salty’s on Alki can seem like it costs a pretty penny if you’re used to the chain-ish types of restaurants, but man is it worth it. In April the special menu event is lobster and shrimp stuffed almond served with risotto simmered with olive oil, onions, garlic, and dry vermouth. It’s their take on the winter comfort food with a spring twist. I can’t wait to visit Salty’s again. Maybe I’ll go during Seattle’s restaurant week. 112 restaurants in the Seattle are offering 3 course meals for $25 and Salty’s is one of them. Restaurant week is April 18-29, 2010 and it’s a great opportunity to try out a new place or go back to a favorite haunt. Hours for dinner vary, but the last seating at night is between 8:30 and 9:30 – winter and summer respectively. Freemont is a quirky, little neighborhood in Seattle. 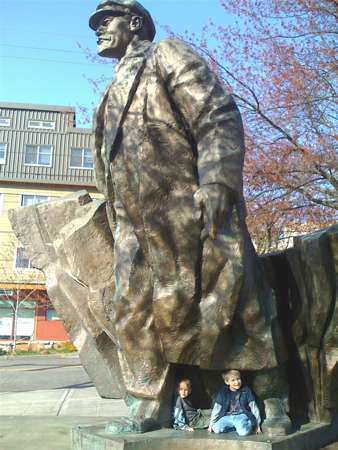 There you will find the Space Building, the Troll and the Freemont Rocket — and in between them all is a statue of Lenin (it’s the real deal!). Also, a great gelato shop. 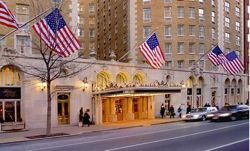 The historic Mayflower Renaissance Hotel in Washington DC is celebrating their 85th anniversary this year, and visitors to the hotel are the ones getting a gift – a special promotional rate of $185 per night (excluding taxes) available through February 2011. To book the 85th anniversary package, use the code YX1 in the Corporate/Promotional code box when making your reservation online, or call 1-800-228-9290 and ask for promotional code YX1. This package is valid Friday-Sunday through 2/2/11. Tax is excluded, and a limited number of rooms are available under this promotion. Blackout dates do apply, and it’s not valid for large groups. The Mayflower Renaissance Hotel is located on Connecticut Avenue in Washington, DC. It’s a four diamond hotel, and is a member of the Historic Hotels of America. Amenities include high-speed internet access, turndown service, a full-service business center, and fitness center. This 583 room hotel offers 74 suites and 26 meeting rooms, and has three restaurants/lounges on site. The world-famous National Cherry Blossom Festival in Washington, DC is an event that not only celebrates springtime, but also the 1912 gift of cherry blossom trees from Japan. This year, the festival is taking place from March 27th through April 11th. Are you planning a trip to Washington, DC for the festival? 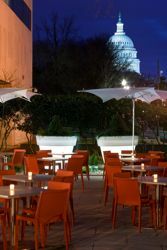 If so, consider the Cherry Blossom Getaway at the Liaison Capital Hill Affinia Hotel in Washington, DC. This package is based upon availability and is offered from March 26th to April 30th. The Liaison Capital Hill offers 343 recently renovated hotel rooms with signature Affinia beds, flat screen TVs, high-speed internet access and more. The hotel has a seasonal rooftop pool, along with a signature restaurant – Art and Soul from celebrity chef and two-time James Beard award winner, Art Smith. It stands like a beacon in the middle of the state of Washington, beckoning hikers and climbers from around the world. 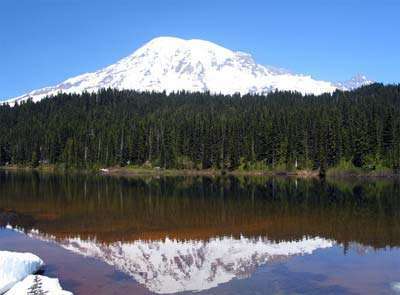 But Mount Rainier National Park has so much to offer besides the challenge of the mountain. The park was the fifth national park ever established, and was designated so in 1899. About 1 million people visit the park every year to see this active volcano – don’t worry, it’s been over 150 years since the last eruption. Of those, about 10,000 attempt to make the climb to the top of the 14,410-ft tall peak, with about a 25 percent success rate. But even at the lower altitudes, the park offers an array of scenic vistas, from glaciers to fields of wildflowers in the spring. Emmons Glacier, on the north side of Mount Rainier, is the largest glacier in the continental United States and is one of twenty-six that ring the mountain. The forests that surround the mountain are said to be over 1,000 years old and are home to countless species of wildlife, from black bears to birds. And all of these offer countless great photo opportunities. Park Hours: Open year-round. The Longmire Museum visitors center is open year round (with the exception of certain major holidays); the rest are open seasonally. Admission: $5/person or motorcycle for a 7-day pass; $15/vehicle for a 7-day pass. Other park highlights: As mentioned previously, Mount Rainier is popular with mountain climbers, who feel compelled to take on the massive challenge of reaching the peak. Only those extremely experienced should even attempt the climb. Easy site seeing: Take the scenic drive to the Sunrise Visitor Center, which on clear days, offers views of Mt. Rainier, Emmons glacier and many other peaks in the Cascade Mountain range from an elevation of 6,400 feet. The drive from Longmire to Paradise is also popular. Best hotel in the park: There are two hotels within the park. The Paradise Inn is the better of the two due to its location, near to the main visitors center. If that is full, try the National Park Inn, which is older and about 10 minutes from the main visitors center. Both start at about $115/night per room. Other Lodging Options: Just outside the park, are a smattering of hotels, but if not staying inside the park, it’s best to seek accommodations back in Tacoma or Seattle and just make a day trip to the park. Best months to visit for weather: Summer because the area is legendary for its deep snows that have been known to fall as early as late September. Best months to visit to avoid crowds: Late May/early June or early September just after Labor Day. Bus/Train – Greyhound and Amtrak service Seattle and Tacoma. A personal vehicle is the only way to get to the park. When our Pacific Northwest road trip brought us near our final destination of Seattle, we took a left and headed instead for Washington’s Olympic Peninsula. Olympic National Park is home to tiny tidepools, enormous drift wood, rain forests, snowy peaks and stunning views. You can see a little of a lot in a day’s drive through or you can discover all the details spending days exploring this wonderland. Yes, it is wet. How do you think things grow so tall and get so green? But on the clear days, you can see across to Canada. If you can keep your eyes off of the wildlife. Wilderness. To appreciate Olympic National Park you need to hike away from your car. Nearly all of the park is forest, mountains, rain forest, seashore, rivers and valleys requiring varying durations of hikes to get there. $15 per vehicle. $5 for motorcyles, pedestrians or cyclists (free under Age 16). Pass is good for 7 days. Additional costs for overnight wilderness stays and camping. Short walks through Hoh Rain Forest or discovering tidepools along Rialto Beach. Choosing from a variety of hiking trails in the Staircase region surrounded by enormous fir trees. Catch & release fishing on the Quinalt River or in many other lakes, rivers and shoreline spots. Drive up to Hurricane Ridge to take in the snow capped peaks of mountains all around and coast below. 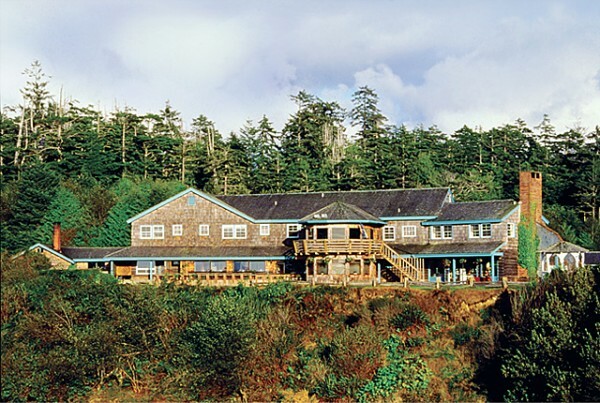 Kalaloch Lodge boasts beautiful sunset views, situated on the Pacific Ocean in the park with full amenities. Well that depends on where you want to be. There are 16 different campgrounds covering all regions. 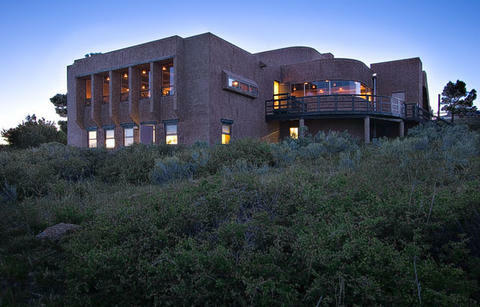 Mora is in the woods but near the ocean, open year round with running water and plentiful sites. Everything from primitive campsites to RV accommodations, cabins, and hotels. Plentiful lodging options nearby the park as well. July, August & September (unless you are looking for winter activities). June & October have less visitors with better weather. 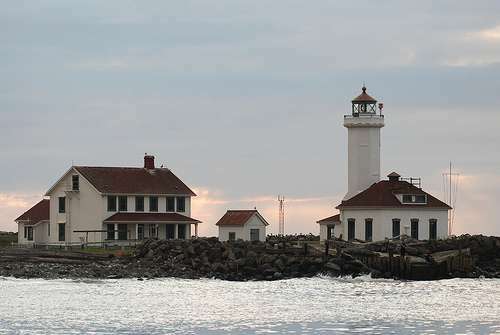 Port Angeles is closest, Seattle is largest. 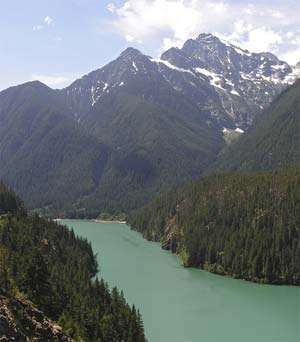 Often referred to as the “American Alps,” North Cascades National Park is full of mountainous peaks, rugged terrain and glaciers (over 300 of them). Early trappers and pioneers found the mountains so impassible at times that they gave them names like Damnation Peak, Mount Despair, Mount Fury, and Forbidden Peak. Even today, only one road completely bisects the park from east to west (Hwy 20) and that usually has closures during the winter months due to avalanche concerns. Summertime in North Cascades National Park is a different story, however. While the peaks are still snowcapped, the lower areas are full of wildflowers, animals and plenty of things to do for outdoor enthusiasts. And because the park boundaries also encompass the Ross Lake and Lake Chelen National Recreational Areas, visitors to the park have opportunities to enjoy numerous water activities, as well. Park Hours: Open year-round. The main visitors center headquarters is open year round, but the rest are only open seasonally during the warmer months. Admission: There is no fee to visit the park. Other park highlights: The North Cascades Institute offers a family getaway package during summer weekends ($225/adults; $155 ages 3-17) that includes 2 nights lodging, 7 meals per person and days filled with classes and programs that include hiking, arts/crafts and exploration. Think of it as summer camp for the entire family. Easy site seeing: Take the Lady of the Lake tour ($39 – $59 roundtrip) up Lake Chelen, cruising past snowcapped mountain peaks, to the hidden town of Stehekin. There are plenty of things to do there, but be sure to leave time to take a bus tour ($7/person) to Rainbow Falls, where the air is so cold the water is already crystalized by the time it cascades to the pool below. Best hotel in the park: Within the park, there are two options for hotels. Ross Lake Lodge, on Ross Lake (of course), and the resorts and other lodging in the town of Stehekin, which is only accessible by boat or seaplane. Best campground in the park: There are several campgrounds within the park. 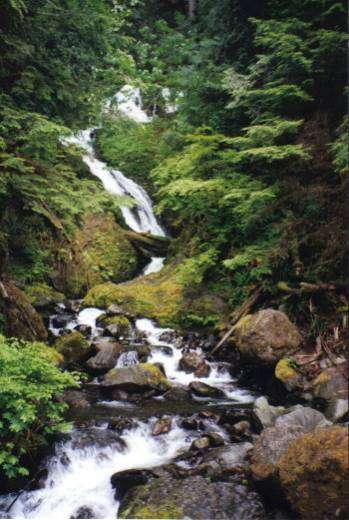 Try the Newhalem Creek campground ($12/night), which has sites to accommodate even large RVs. The area has plenty of hiking trails, as well as fishing opportunities due to its closeness to the Skagit River. Other Lodging Options: Just outside the park are a smattering of hotels, but if not staying inside the park, it’s best to seek accommodations back in Tacoma or Seattle and just make a day trip to the park. If you’ve never seen Peter West Carey’s photographs, prepare to be blown away. This photographer and avid traveler shares the view from his lens on the Carey Adventures – and is about to embark on an incredible journey through Africa and Nepal with his People, Places and Patterns Project (which, incidentally, you can help fund through Kickstarter – I did!). And what’s really cool about this project is that he is bringing his daughter, Sabrina, along for the ride. But why stop with just one child? After the trip, Carey plans to give talks at schools, libraries and other community groups to help educate other children (and their parental units, too) about what life is like in Africa and Nepal through his photographs and stories. Pretty cool, no? When not traipsing the globe with his giant camera bag, Carey calls Seattle home. And when I asked him about one of his favorite places to eat, he waxed a little poetic about Blue C Sushi. Apparently, it’s one of Sabrina’s faves, too. Carey credits the fresh Pacific Northwest seafood for Blue C’s great food. He and Sabrina both recommend the Seattle rolls – a mix of fresh Pacific Salmon, avocado and cucumber. But taste and try a little of everything – it will likely be hard not to with so many temptations going past you on the conveyor belt. (Other locations listed on Blue C Sushi Website). Photo courtesy of Blue C Sushi’s Facebook Fan Page.